If you’ve worked with children as a parent, teacher, doctor, or in any capacity, you’ve probably read a lot about how screen time affects them, and there are many advocates of screen-free childhoods. There’s plenty of information out there, and it can be confusing to decide whether tech is good or bad for kids. Honestly, I see both sides of the argument. 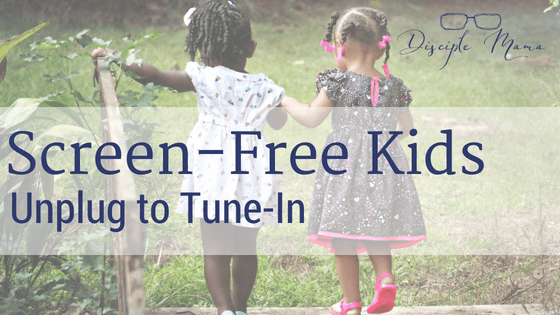 My kids aren’t being raised tech-less, but my husband and I are being intentional about screen-free parenting. I can’t remember exactly when we first talked about keeping E, our first son, screen-free. I’m sure it was after he was born. At just a couple of months old we noticed him really focusing in on the TV. It got to a point where he didn’t look at anything else if it was on, so we turned it off and kept it off anytime he was awake. At first it wasn’t easy. I was tired and he was a terrible sleeper, and all I wanted to do sometimes was hold him and watch something so I didn’t have to exert any extra energy. But, it didn’t take a terribly long time before we just…got used to it. It’s not like we had been watching TV all day before, anyway. E didn’t have to adjust to not using a phone or tablet because he never had used them. Though we really hadn’t done any research or had in-depth conversations about it, screen-free parenting just felt right to us. This post may contain affiliate links, which means if you click through and make a qualifying purchase, I will receive a small commission at no additional cost to you. I only recommend products I have used and enjoyed. First, let me explain that ‘screen-free parenting’ is a slight misnomer. My husband and I use our phones, laptops, and tablets around the house for a number of things, though generally not with the boys around. FaceTime (video calling) with our families is important in our home. It’s completely interactive and experts generally agree that video call minutes do not count toward screen-time totals. Family Photos/Videos are also fine (but, in our case, limited…E could watch home videos all. day. long.). These help familiarize babies and toddlers with the faces and voices of family members. Tip: narrate the photos for your child so they learn names and start to appreciate the context of the picture. Music videos are a once-in-awhile special treat for E since he turned 2. And before you get too worked up about it, they’re MTC (that’s Mormon Tabernacle Choir), not MTV , guys. His fave is the Hallelujah Chorus, with How Great Thou Art following closely behind. Other than those exceptions, and the odd waiting room or a tv running at someone else’s house, we just don’t give our kids screen time. My phone has no toddler apps. Not even one. My kids don’t watch TV. No Daniel Tiger. No Sesame Street. No Dora the Explorer. Guys, I don’t even know what other shows are out there for kids right now, because we don’t watch them. My (now 3-year-0ld) son views Youtube videos (like the Mormon Tabernacle Choir videos) under close supervision, and every once in awhile I’ll show him a video of a bird we’re learning about or for a specific demonstration of something that I can’t explain well (or we don’t have a book about). In fact, it’s been months since he’s watched more than 30 seconds of YouTube video in one shot, and most weeks he doesn’t watch any. If you’re not sure about screen-free parenting, try it for a week before you commit entirely! But, be sure to be thoughtful about how to introduce the screen-free week to your kids. Going into it cold turkey with no warning might be tricky, depending on the age of your children and the amount of screen time they are accustomed to. Keep in mind that going screen-free when you haven’t been in the past will require a lifestyle shift for your kids and for you. It will probably take more than a week to really form habits that make it easy to function without devices to lean on. 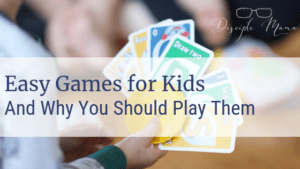 Proper planning and alternative activities are important, especially in the beginning, until your kids are accustomed to playing without the additional entertainment that screens offer. In this day and age, screen-free parenting may seem extreme, but there are a lot of reasons I have opted to keep my kids largely screen-free. Our intentional focus on discipleship parenting is one of these reasons. There are few shows out there that I feel would meet our personal standards for our sons. Maintaining a Christ-centered environment is valuable to me and my husband, and we don’t think that most TV or online videos would contribute positively to that. 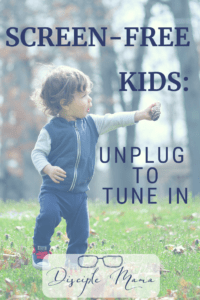 There’s plenty of time in the future to add appropriate screen time to my kids’ lives, and I feel that it’s a lot easier to add screen time into our lives little by little, as necessary, than it will be to take it away later on, once my kids are used to it! What are the Recommended Screen Time Limits? Here are the latest screen time recommendations from the American Academy of Pediatrics. The AAP recommends that babies younger than 18 months stay away from digital media altogether, except video chatting. Toddlers in the 18-24 month range should only be using digital media with their parents, according to the AAP. Screen-time during the toddler stage interferes with the development of a longer attention span. Toddlers who watch more TV have more attention issues (in general) a few years down the road than those who go screen-free. This is because they acquire language (and so many other skills) by interacting with humans. So, if your toddlers must be on screens, sit and watch with them, talk them through what they’re watching, and you’re all good! The recommendation for 2-5 year olds is that they spend 1 hour or less of high quality screen time every day (and as much of that time as possible should be co-viewing with parents). How much screen time is ok for my kids? Aside from the screen time guidelines for babies and toddlers, determining how much screen time is ok for kids to have is not a simple thing. Honestly, you can find data out there to back up almost any stance that you want to take. That being said, there are good ways to determine how much screen time is healthy for your child. Refer to your list of family core values. Consider how screen time contributes or detracts from the development of those values. Conduct a screen time audit Choose a typical week and carefully log your kids’ screen time (tv, phones, tablets, video games). Add up the minutes each child spends with tech and divide by 60 to find the average number of hours they’re spending on screens each day. Are you comfortable with this number? Does it surprise you positively or negatively? Think about your kids individually. How do they act when they’re playing with or watching screens? How do they act when it’s time to put the screens away? Do they show any signs of tech addiction? Think about how much time you have as a complete family unit. When the whole family is home together, how do you spend your time? Are you making the most of your family time? Is tech facilitating or standing in the way of the discipleship of your family? Consider and discuss these points with your spouse and come up with a healthy screen time plan that works for your kids and your family. 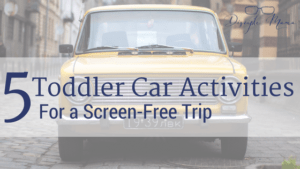 Get my FREE Screen Time Audit Chart! If you’re not quite ready to nix screen time altogether, try setting some healthy screen time limits for your kids. The dinner table– Family mealtimes are awesome for spending quality time together, so keeping screens away from the dinner (or breakfast, or lunch) table is a great way to increase family bonding, work on manners and etiquette, and maximize your opportunities for discipleship of your kids! Kids bedrooms– Kids who have screen time should be monitored closely while they are using their devices. When they’re super young, birth-age 5, they shouldn’t be watching or playing with screens without you at all. When they’re older, you’ll want to be close by and paying attention to what they are seeing, hearing, and playing for safety’s sake. Making bedrooms (and any other closed-door areas) screen-free zones is a great way to set screen-time limits. 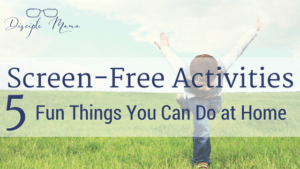 The bathroom– With the possible exception of during potty-training (I know quite a few kids that wouldn’t sit on the potty without some form of entertainment), setting up a screen-free zone in the bathroom is a good idea. Bathrooms are closed-door areas, which means if your kids are using their devices in there they’re usually unsupervised, and that’s a safety issue. Also, the bathroom is full of hazards for your devices…sinks, bathtubs, showers, and toilets all spell danger for your tech! My potty-training entertainment suggestion? Get this book. Mealtimes- again, family mealtimes are so important! Keep them special by nixing device use while you’re eating. Outdoor time– If your kids are outside (and they should be, as much as possible), keeping them off their devices is an easy way to limit screen time. Being on a screen during outdoor play time negates almost all of the benefits of outdoor play, so it just makes sense to leave the screens for indoors. Encourage physical activity and enjoyment of nature by keeping the devices inside. Screen time parental control– There are parental control apps for screen time available for Apple and Android devices that will do various things to keep your kids’ screen time to the maximums that you set. Different apps work different ways, and, since my kids don’t use devices anyway, I haven’t tried any of them. My advice: check your app store, read reviews, and ask your friends what they’ve tried. 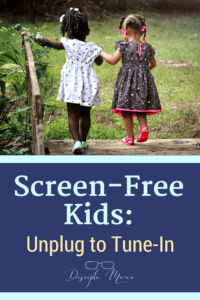 Setting screen time limits is great if you don’t want your kids to be totally screen-free, or if homework or other issues prevent you from keeping your kids screen-free. Just remember to be consistent with your limits, so that your kids learn to respect screen time boundaries. The goal here is to keep kids safe, healthy, and ultimately, to help them learn how to self-limit screen time. Something else to consider: how you and your spouse (or other adults in your household) will respect screen time limits, which probably looks a bit different than how you’re asking your kids to do it. It’s okay for adults and children to have different tech rules and screen limits, but think about what makes sense for your family and how you can best lead by example. My kids won’t be screen-free forever, and I don’t want them to be. I want them to be tech-literate (proficient, even) because, let’s face it, they’ll need to be. But it’s easy to add more and more devices to their lives and not so easy to take them away, so we’re starting out slowly. That being said, there’s no judgment here. It’s tempting to plop the kids down in front of the tv to enjoy a moment of peace. I’ve brought my kid into bed in the morning, put my phone in his hands and told him he could watch Mormon Tabernacle Choir videos to his heart’s content while I got just 15 more minutes of almost sleep. And you know what? If kids have a bit of screen time, they’ll be okay. I know more than a few that have turned out fabulously! From a discipleship parenting perspective, Philippians 4:8 should be in the forefront of our thoughts when we consider the media we’re exposing our kids to. Intentionality is key. We should be mindful of what our kids are watching/listening to. Mindful of how much time they’re spending on electronic devices. And mindful of how they’re acting when we take the devices away. How does your screen policy support your discipleship parenting goals? Do you want to keep screens off of your holiday shopping list? Check out these screen-free experience gift ideas for the whole family, OR these great low-tech toys! We kept both of our kids as screen free as we could until after they turned 2. It’s become much more difficult now that they are older, but we still try to limit it. I ave that personal inhospitable areso much more important. We really try to limit screen time too. I have a 1 and a 3.5 year old. It was a lot easier with our first to limit until she was about 2 but now with her being bigger our little one is certainly exposed to it more than our first. However, we try to use screen time with our oldest as a chance for one on one time with the baby talking, playing and singing. I think it makes a big difference when you have a kid that live without tv or technology. I often have family members try to give my kids phones or tablets when we are out to dinner and I stop that QUICKLY. I want my kids to know how to handle themselves in public without technology. We put ours away too to set a good example. Wow the words per hour fact was really a gut check. That make so much sense. My kids still watch a lot of educational programming (PBS type shows), but I let the iPad die several months ago and never looked back. Their attitudes were just awful after a minimal amount of exposure. This is so important! I’m glad you wrote about it. As a teacher, I noticed what a HUGE difference screen time made in my students. There were a few students who were struggling in school. I would casually ask them what they liked to do after school. Predictably, they would tell me about their favorite video game. I found that my students who learned quickly and performed well were those who spent a lot of time reading. They were also more active. I agree with you about helping them to be tech-literate though. You’re right that it’s a necessary skill. I think you have a great perspective. Thanks, Brooke! I was a teacher, too, before I became a mom. Tech can be so good, but it can also be addictive and is often overused to the point that it becomes a negative. I think later introduction to tech can’t hurt, and then it needs to be used with careful moderation (which applies to a lot of things, doesn’t it?!). You share some great information and recommendations! I totally agree that delaying screen time is so important for little ones. Teaching kids screen time safety is another huge piece of this as well. Yes! Screen time safety is SO important, and I’m glad you pointed it out! It would be great for me to plan ahead for how to teach this to my boys as we do eventually introduce screen time into their lives (whenever that happens). This is the best article I’ve read about screen free parenting. You are encouraging instead of pushing down parents that use screens. What I love the most is that with a lot of us that grew up with a lot of screen time, we take it for granted that we have access to any type of knowledge at our fingertips. You are teaching your kids to appreciate that. They know if they are learning about something that they can go to the internet as a resource, not just as a way to watch videos all day. Thank you!! Hi Jessie! I really thought long and hard as I wrote this post because the last thing I wanted was for people to feel judged about the way they choose to use screen time in their homes. Even when I was pregnant and right after E was born, my husband and I didn’t plan to keep him screen-free, but we just noticed so quickly that, even as a newborn, having the tv on in the background was distracting to a crazy degree! 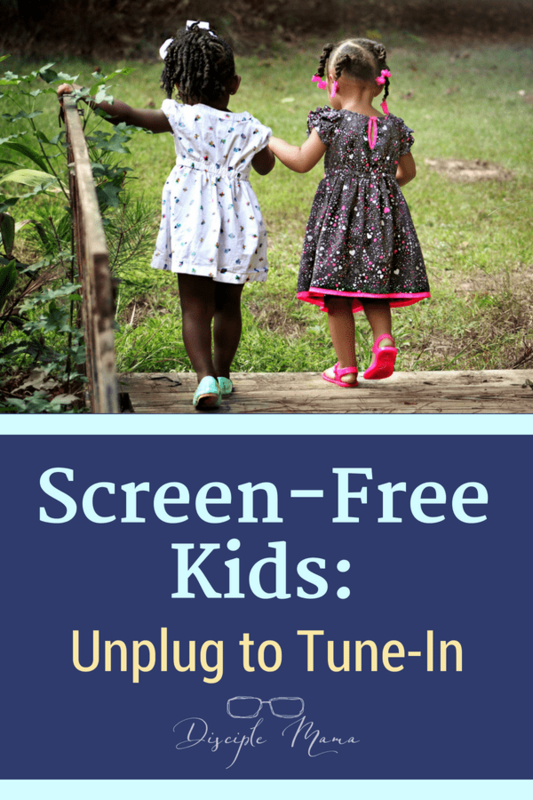 We just felt good about being screen free, but there are a lot of people out there who do a great job of carefully monitoring, limiting, and co-watching with their children and the screens they use. I just want to help people find what works for their own families! I’m really glad you found this post helpful! Thanks for visiting my blog again today! Love this! As a therapist, I try to encourage parents to limit technology, but most have little desire, even when they are seeing the negative attitudes, behaviors that come along with it. I will be referring them to this article to give them some great, honest, and encouraging advice with sound stats. Thank you! I know it’s really hard to change screen/media habits (both for parents and kids), but it’s sad that even when people are seeing clear negative effects of too much screen time they’re not willing to cut back. I hope you persist in educating parents about the benefits of limiting screen time for their kids in spite of the pushback that you receive. You are welcome to share this post with anyone who may find it informative or helpful! Thanks for visiting my site today! My girls are on the older side, 6 and 12. We definitely have some screen time rules, but we constantly evaluate and re-evaluate. One of my favorite products for the younger one is the Kindle with Freetime Unlimited. It allows me to set the amount of time they are allowed on it based on the activity. I can limit it to apps for 15 minutes, 30 minutes for reading (or whatever times I want) and no videos and set rules so that they can’t access apps until educational requirements are done. Now my oldest daughter is a different story. All her school friends have cell phones–and she is the only one that does not. She does have an iPad with rules of use and it have set all kinds parental controls, but even so there are loopholes and so I constantly have to check it. It is a whole different kind of parenting. Luisa, thanks for mentioning Freetime Unlimited for Kindle! I’d never heard of it before, but it sounds like a great tool for keeping control over screen time! Peer pressure does make it trickier to keep older kids screen-lite, I’m sure, but I commend you for staying on top of it! Thank you for visiting my blog today! Well done! I love all of your discipleship concepts for childrearing. Our oldest children were born in the 1970s and we chose not to even own a television until sometime in the 1990s – all for the very reasons you state about avoiding screens. Communication, deep thought, learning to articulate, actually seeing and conveying the preciousness of others through eye-to-eye contact and thoughtful interaction – all of these are lost when the noise and distraction of our devices and gadgets are running and distracting us. As a writer, in my typical work day at home, I turn on no television and seldom any noise at all, so I can think. Most of us aren’t aware of the importance of silence to human thought and spiritual interaction with the Lord. These are great rules you’ve made for your household! How great that you were able to preserve some quiet with your children when they were young! I think it’s so special and so uncommon for that to happen today. Thank you for visiting and for your thoughtful comments today, Melinda! Excellent article! I will be sharing this with some friends who are struggling with this issue. Thank you! I’m glad you enjoyed the article, Michelle! I am happy for you to share the article with anyone it may be a blessing to! You are such an inspiration! I love this article and all of your suggestions for how to navigate the tech world we live in today. Being intentional about screen usage with kids is wise beyond words. Our kids are older, but we tried to limit the amount of screen time. In hindsight, I wish we had done more, so I encourage you to keep holding on tightly to all you have said here. I watch very little TV and prefer silence when I work, much like Melinda mentioned above. It is clearly helpful, because white noise machines are basically designed for this same effect. God bless you and your wonderful ministry! Silence is difficult, but it is also so important! I agree with you and I hope that my kids can have an appreciation for the quiet in their lives! Thank you so much for your comments today, Melissa! This article is full of great encouragement and data for parents! My sister works as an Occupational Therapist in the elementary schools and keeps telling me how she see the screen time impacting kids’ visual abilities in school. I’m not sure the world really understands the long-term impact screens are having, will have, on this generation. I really appreciate you bringing this issue into the light. More and more, people are coming to realize that we can’t just entertain kids (even with educational entertainment) with impunity. It makes sense to me to be careful and thoughtful about what we expose our kids to, especially when, as you say, we aren’t sure what the long-term impacts will be! I hope she enjoys it! Thanks for visiting my blog! What I like about your approach is that you suggest readers can try it out in small bites, one week first – that’s a good idea. My approach is to turn that around. Modern television gives me a precise idea of how the majority think, and although I agree with you that there’s not much Christian-centred attached to that, I see that as something secondary – because I can use the information to frame what I’d like to say, and to use common ground to start a conversation. I don’t have toddlers anymore :-), so I cannot answer that question, but some kind of balance would probably be what I would go for – without too many restrictions. Thank you so much for your feedback! I appreciate the conversation! Perhaps you’ll write some more blog posts after some time which direction your family will take with this? Hi Edna, I think I probably will write more about this as my kids grow and our screen policy changes! Thanks for stopping by my blog!